Since I don’t follow a particular curriculum that schedules readers and read-alouds for us, I like to make my own list of books to read out loud and books to “assign” (or sometimes just suggest) for independent reading. I did this in an organized manner for Miss M for the first time for our current school year (2nd grade). Last summer I created a Google doc with a list of 20 or read-alouds and 15 books I thought she could probably read independently but might not be likely to find or choose on her own. As the year has gone on, I have added and subtracted from the list as needed, and marked books off as we complete them. Even though I didn’t schedule the books, I’ve liked having a list to refer to as I take a few minutes to make new requests at the library or place an order on Amazon. The research and “thinking” is already done for me! I’m getting ready to make a new list for this summer and our next school year, when Miss M will be a 3rd grader and Mr E a kindergartener. From lists suggested by various curricula to lists compiled by libraries to lists made by bloggers, I’ve found more ideas for books to read than we could possibly read in a year 🙂 The hard part will be picking a reasonable number for this next year’s list. But I am happy to have such a wide variety of suggestions available to me as I need to find more reading materials in future years or as our needs and interests change. Best Kids’ Books Ever (Op Ed @ New York Times) — be sure to see the follow up articles here and here. And while not exactly a “list”, I love to read about what other bloggers are reading out loud by checking out Read-Aloud Thursday each week @ Hope is the Word. I’ve gotten a lot of ideas from other bloggers’ posts in this weekly link-up! 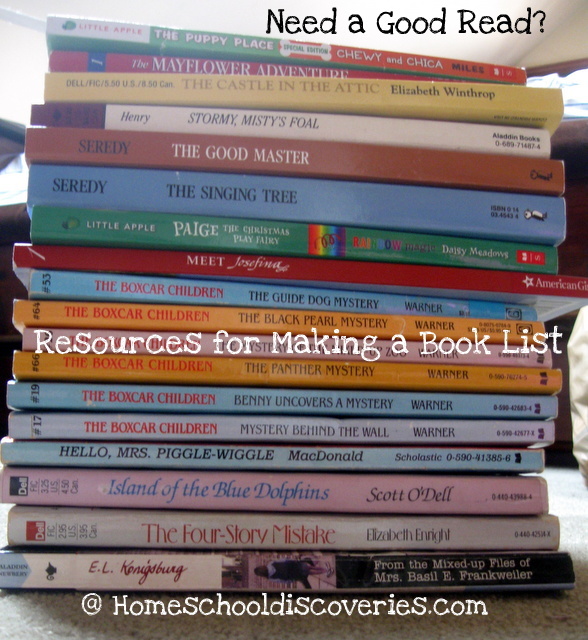 Happy List Making (and Reading!) Do you have any other favorite resources to share? I certainly did not start out this week planning on teaching the kids to sew. Miss M has been asking to learn to sew for months. Now, I know a little bit about sewing, but it’s not a really strong skill of mine. My game plan was to enlist some friends who are better sewers to help Miss M learn how to sew this summer (and I still might enlist their help if her interest continues!). However when Miss M asked me yet again if she could do some sewing…or “even please mom just give me some fabric and tape to make something?”, I decided to say “yes”! Inspired by the “10 Days of Pouring Into Your Child’s Passion” series at Blog, She Wrote and by this post about simple sewing skills at Many Little Blessings…I decided that I could at least get Miss M started with a needle, thread and a piece of scrap fabric. Then Mr. E wanted to learn too! That was a bit more of a stretch for me, but I said “yes” to him too! I drew the line at Mr. K and told him he had to turn five before he could sew! Hand sewing went pretty well. Mr. E and Miss M made little bags and pillows, though Mr. E later turned a couple of his creations into “wrecking balls” by wrapping the thread around in interesting ways! After a couple days of practice on hand sewing, Miss M thought she was next ready to try a skirt for one of her dolls. I watched a tutorial video and decided that maybe, just maybe I could pull out the sewing machine and help Miss M put a skirt together in that way. We made our own skirt pattern following the directions in the video and I did most of the sewing on the skirt, since I was trying to reacquaint myself with the machine. I consider it a small miracle I even remembered how to get it going! 😉 Unfortunately, the skirt turned out too small. I hope I can keep the momentum going to try again. Maybe we’ll BUY a pattern this time! 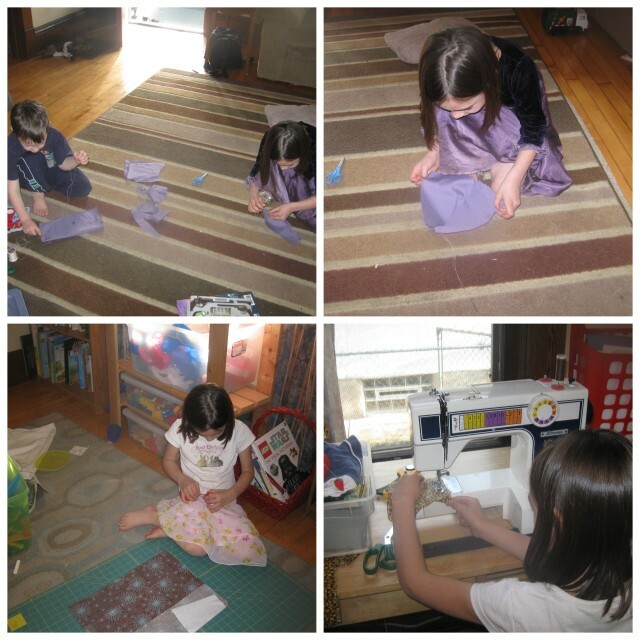 Meanwhile, I did also let both kids try a bit of machine sewing to make a couple of tiny pillows. 1. We wished “Betsy Ray” a Happy Birthday in “Deep Valley” last Saturday. Read about it here. 2. and 3. We started a new Family Science topic with a Science Sunday with Dad about plants. Miss M will be putting together a notebook/lapbook about plants…and here the boys are coloring in their own version of a sheet about plant parts. 4. and 5. Week #2 of Logic of English Essentials for spelling went really well. Both Mr. E and Miss M enjoyed Phonogram Bingo on Monday. We played a phonogram game involving hopping up and down the outside steps on Tuesday. I felt like we didn’t spend as much time as I would have liked on spelling this week, yet Miss M did a great job on spelling word dictation today! She told me she loves her new spelling feels like “this is finally the right spelling for us!” Yay! 6. Mr K is ready for summer! This is what he was “playing” while the bigger kids did their hand sewing on Monday. 7. and 8. We did about three and a half lessons of Right Start Math this week, including playing a Sum Rummy game, filling out a multiplication table and making a multiplication table out of cards. I wish I could say math went as smoothly as spelling this week. This was, unfortunately another one of those “character building” weeks of math that I suspect had little to do with the math itself. One day Miss M was totally tracking with multiplication, and then today we could not even get through a whole lesson that looked pretty easy to me due to attitude issues. Huh. I’m praying for insight to know whether this is directly related to math and we need to slow down or camp out on some of these topics before moving on…or if math is just the flash point for character areas the Lord is refining in Miss M’s life! 9. This was possibly my highlight of the week…a trip to my favorite semi-annual library book sale in a suburb about 20 minutes from our house. I picked up all the books in the picture (plus a big book on the history of Minneapolis that I missed adding to the pile…that one is for me) for only $10.50! Miss M also picked out about two dozen books that only cost her about $4 of her “book money”. I was hoping for more titles related to our American history studies next year, but I was happy with some Great Illustrated Classics and other chapter books that I hope will appeal to the boys in the next couple of years, a couple picture books, and a few read-alouds to enjoy with Miss M along with the couple history titles I did find. 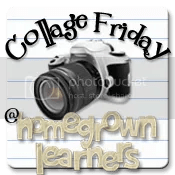 I’m linking up with Collage Friday @ Homegrown Learners! Having just spent the past 45 minutes or so writing and reading posts on the forum for our new spelling curriculum, I just don’t have a lot of energy left for a really “serious” Read Aloud Thursday post yet tonight. I’m still working through my current read aloud with Miss M, and we haven’t read anything really notable for science or history lately. That would normally bring me back to a picture book or easy non-fiction post…but the boys’ library book basket has been languishing the past few weeks in favor of more time to play outside, draw pictures of ideal Angry Birds levels, and creating stories of their own. Tony reads to the boys at night, so I not sure how some of the interesting-looking picture books I picked out at the library have turned out. Most of what I have read to the boys lately have been run-of-the-mill books on their favorite topics. One type of book that comes home with us almost without fail after each library trip is a Star Wars book of some sort. If you have a young Star Wars fan in your house, you might have also discovered that a lot of what is available for young fans is well, dull, for the grown-up reading to their padawan learner. Most of what’s out there is either DK readers with limited vocabulary (great for the reader at that level, I’m sure…but Mr E can’t even read a level 1 reader on his own yet since they are not particularly phonics based) or they are Episode/Movie rehashes. A few new Lego Star Wars books are breaking this mold. We discovered “Lego Star Wars: Save the Galaxy” at the library a couple months ago. Then Mr. E received “Lego Star Wars: Darth Maul’s Mission” for his birthday. Both of these books are funny and entertaining for kids and grown-ups alike. Purists will probably complain because the story doesn’t actually stay true to the movie at the end — for example, a good guy character who dies in the movie instead gets shoved in a closet in the book. But even though my boys are familiar with the “real” story line, they still get a good laugh out of what happens in the book. I’m linking up with Read Aloud Thursday at Hope is the Word! About two months ago, I wrote about our initial attempts at finding a math curriculum that would work for us. I’ve been meaning to write the second part…but I kept putting it off in favor of more time sensitive posts. I made it one of my goals for the week to get back writing it! 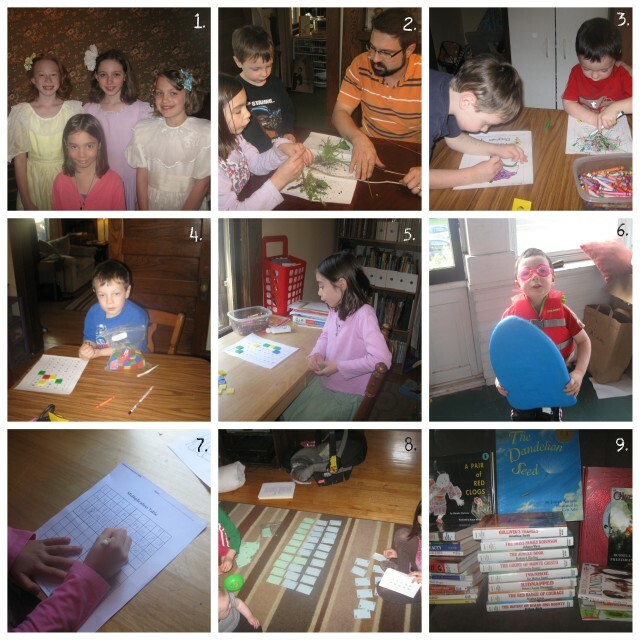 As I mentioned in my previous post, we had already tried Saxon Math K and Kindermath, so when Miss M was a few months into Kindergarten, I knew a little bit about what I was or wasn’t looking for in a math curriculum. I knew I wanted something that was more on the “mastery” side of the spectrum, rather than something as far down the “spiral” end of the spectrum as Saxon Math K proved to be (read this article if you aren’t familiar with those terms). But I also didn’t want something so “mastery” oriented that we would be doing the exact same topic for months on end. I was looking for a curriculum with a strong emphasis on mental math. I liked the idea of having plenty of manipulatives to use (that was something I liked about Saxon K). At that time I was also looking for something without tons and tons of writing. As a K’er Miss M really struggled with writing numbers, and tired of doing so very quickly. I didn’t want her math progress to be hindered by her writing struggles, nor did I want to spend excessive amounts of time being her scribe for worksheet after worksheet. 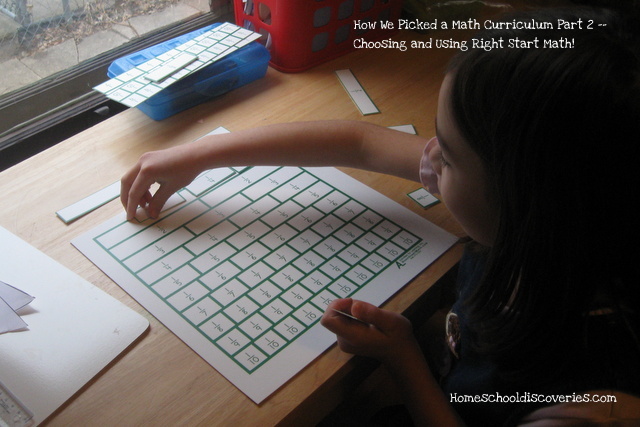 After doing a bit of research, I first narrowed my choices down to RightStart and Singapore Math. Singapore is more workbook based by far than RightStart, but all the good reviews and the ways it met my other criteria caused me to give it serious consideration. I looked over both programs with my husband. He was impressed with the research behind the creation of RightStart, and we both thought the use of the abacus and the card games as a method of reinforcing concepts was very intriguing. We purchased RightStart level A in January 2010. Since Miss M had some previous math experience, we were able to fly through level A fairly quickly. We finished nearly all of it in the last 5 months of her K year. We completed Level B last year when Miss M was a first grader, and we are currently working on Level C. This year I started Mr E (just turned 5 in March, so still technically a “preschooler”), casually in Level A. We do parts of various lessons when he shows interest, or I just keep the concepts in mind and talk to him about them as he asks “mathy” questions. In general, we’ve been very pleased with RightStart Math. It is a bit more toward the middle of the “spiral-mastery continuum” than I initially thought it might be, but it is still “mastery”-oriented enough to provide adequate practice on various concepts (especially when one considers the daily warm-ups and extra game playing possibilities) while also giving variety and covering important topics like measuring, time, calendars and geometry. RightStart does take a lot of direct teacher instruction, at least in the levels we have done so far. I’ve heard that some parents have had some success at the higher levels in giving an older student the teacher’s manual and letting them work through the lesson independently. I find that I need to plan on 20-30 minutes of focused attention with Miss M most days, and some days we may spend longer (especially if we play a game or deal with “attitude issues” we need to work through!). Some users find the they can write out the daily warm ups to save on some of that teacher-intensive time. It is hard to find time to play the games. We love most of the games (though we have found a few to be boring! ), but unless a game is directly called for in the lesson, we honestly don’t take the time to play them as often as we should. It’s very helpful that Mr. E is now old enough to play some of the games with Miss M (sometimes I help Mr. E on harder games or give him a “cheat sheet” of some sort). However, it is often very hard to keep Mr. K out of things. He insists that HE wants to play too. But even with help, he doesn’t have the patience or self control to really play the games. More than one math card game has been destroyed by a careless or reckless toddler before the game was finished. That’s very frustrating for the game players! The best we can often do is to distract Mr. K with something else (he stopped napping well over a year ago, so that’s not an option for us), which may or may not work. We’ve had some frustrating days in Level C to be sure (though I am sure this would be true of any math curriculum!). Some days I know I have to have some trust in the process. Even though playing games and learning the multiples of each number and doing subtraction on an abacus isn’t how I learned math, I can see that it will probably produce kids with true understanding of what’s going on with the math, not just an ability to fill out a math test in school. As of right now, my plan is to take a break on new lessons from level C with Miss M over the summer (we’ll still have somewhere between 20-35 lessons left, depending on how the next five or six weeks go!). I’ll have Miss M do the “B-side” review pages from throughout level C, as well as math facts practice over the summer (hopefully via some games! ), unless she requests new lessons. Every six days the RS C student manual has a review page with two sides that cover the same concepts, just different problems. All year we only did the “A-side” of these review sheets, leaving the opposite sides conveniently blank for summer review. Casual math for Mr. E will continue as he has interest over the summer. Even if you aren’t in the market for a new math curriculum but you like card games, I would encourage you to check out their games book and kit. The Right Start games could be a fun supplement to any curriculum, and the book contains games to practice almost any elementary math concept! The ten book “Betsy-Tacy” series is closely based on the life of its author, Maud Hart Lovelace. Maud’s (“Betsy’s”) childhood home in Mankato (aka “Deep Valley”), along with the childhood home of her best friend Bick (“Tacy”) have been restored and are maintained as museums by the Betsy-Tacy Society. One of my cousins was getting married this past Saturday in Mankato, Minnesota (both sides of my family are from Mankato originally, and I lived there for five years as a child). 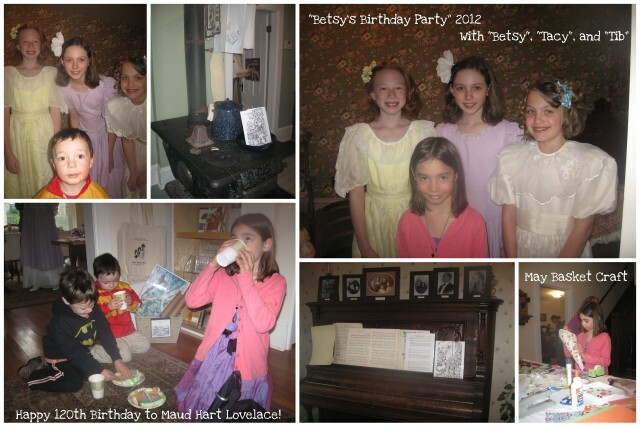 I’m a fan of the Betsy-Tacy Society on Facebook, and I just happened to notice that their annual celebration of the birthday of Betsy/Maud would be the same day (Maud’s actual birthday is April 25th). The timing was perfect (the celebration was happening during the few hours just before the wedding), and the location was convenient (the church was less than a mile away from the Betsy-Tacy houses!). How could we not go? This was our second visit to the Betsy-Tacy houses. Two years ago this summer, we went on a tour of the houses along with the family of Miss M’s best friend (they are like real life Betsy-Tacy’s…they live across the street from each other and have a third friend around the corner!). We didn’t do the tour this time, but we enjoyed chatting with costumed character actors, having cake and lemonade and making May baskets. If you are a big fan of the Betsy-Tacy series like us and like to do lapbooks, you can check out this lapbook I designed two years ago to go along with the first two books in the series. It was nice to have a “normal” week of sorts after our short week last week filled with preparations for Miss M’s Expert Day presentation. But it was a “normal” with an added twist. As I talked to Mr. E about the purchases I made at the MACHE convention and about our plans for next year, he asked why he couldn’t just be a Kindergartener now. After all, he reasoned with me, he is five whole years old now and didn’t he graduate out of the 3-and-4-year-olds class at church and into a class with other Kindergarteners on Sunday mornings? I had to admit, he had some good points. And he probably doesn’t realize this, but a lot of the “school work” he’s been doing already these past few months is about the same difficulty level as what Miss M was doing when she was a K’er. So, I told him he could be a Kindergartner right now in our home school. In honor of that change, I committed to Mr. E to make doing school with him a priority every day that I do school with Miss M. Honestly, other than doing ten minutes or so of phonics every day I hadn’t been doing much with him and he wants more. My school routine this week with Mr. E looked like me reading a chapter of the Bible with him and talking a bit about it, working on phonics/reading for 10 minutes or so, a quick math activity some of the days, and then working on handwriting until he got tired of it. I think it was 30-4o minutes total. But, wow, it made me feel much busier and tired each morning to juggle everyone’s needs with that little bit of extra school load. 1. As I mentioned in this post, I made a big investment in the “Logic of English Essentials” spelling curriculum, which we started right away this week. As much as it is really well planned out, there is still a learning curve, just as there is with many curricula. As much as Miss M was initially feeling a bit put off that we had to start “all the way at the beginning”, I could tell that was really a good thing. I’ll post a more thorough review once we’ve had a bit more time to use it. 2. and 3: On the recommendation of the Logic of English Essentials, I decided to try teaching Mr. E cursive first for his lower case letters (He pretty much taught himself upper case printing, but hardly knew how to make any lower case manuscript letters). He was actually pretty excited about the idea. LOE suggests that learning cursive first can be easier because all letters start at the baseline, the movements are more fluid, and it reduces letter reversals. I’m not 100% convinced of their theory, but I thought we could at least try it! Mr. E practiced cursive on the iPad and by making really big letters on really big sheets of paper. 4, 5 and 6: It was an artsy-craftsy week around here. In #4 the boys were making beaded necklaces while Miss M worked at the desk. #5 is the result when the boys used their new “nice” watercolors for the first time…let’s just say they looked “not so nice” rather quickly! Luckily I could rinse the trays off and they didn’t look so bad. Miss M found my copy of the “Arts and Crafts Busy Book” and set off to follow the directions and make a couple crafts on her own. I love that she is old enough to do that! 7. We went out on a “Spring Nature Walk” in our neighborhood. We haven’t been too “into” nature study in the past, but this was great. Hopefully we can do more of this in the future. If I find the time, I’ll write up a post just about the nature walk. 8. This is my stack of reading from our weekly library trip. Well, at least my stack for “skimming.” 🙂 We’re studying American history next year, and I am investigating various potential “spines” or key texts we might consider using. Miss M has mostly been reading books I bought for her at the Mache conference — three books from the Grandma’s Attic series and Emily’s Runaway Imagination by Beverly Cleary. 9. This week’s RightStart lessons were a breath of fresh air for Miss M. She breezed through lessons 96-100. These were much easier for her than the previous lessons that were thick with lots, and lots, and lots of long subtraction problems. Maybe taking a week off from math was a good thing too! 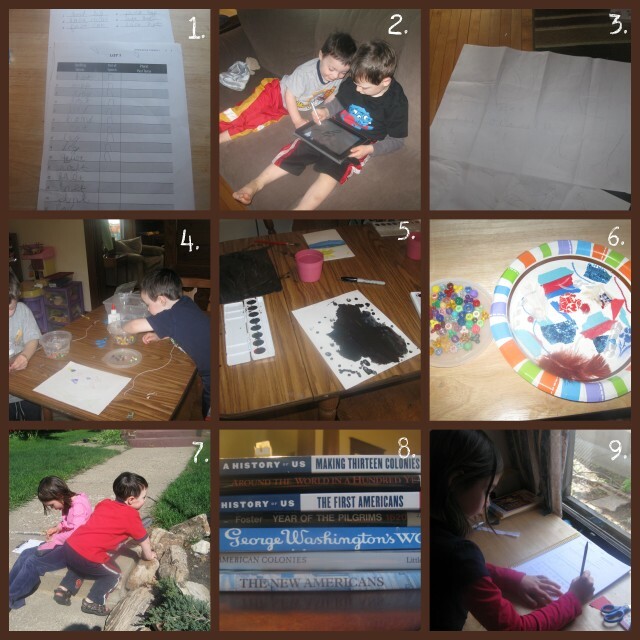 There’s no “official” Collage Friday this week, so I’m just linking up with the Weekly Wrap Up at Weird Unsocialized Homeschoolers! Miss M and I took two weeks off from reading Mystery of History Vol. 3 to read “Once Upon a Horse: A History of Horses and How they Shaped Our History” by Suzanne Jurmain. We just finished a unit study of sorts on horses to prepare for Miss M’s expert day presentation at co-op (she first broadly chose the topic of horses, then wanted to focus in on the subject of how horses were used through history). I reserved several books on horse related history from our library, and this one seemed to be the most generally readable. Jurmain’s book opens with a chapter about the evolution of horses, which to be honest, we skipped in our read-aloud since we hold to a creationist view. I explained to Miss M why we were skipping the chapter. She knows that many people hold an evolutionary point of view, and I’m sure as she gets older this is something we’ll study in more detail. Following this chapter is a discussion on the domestication of horses. The rest of the book is comprised of eight chapters, each covering a different aspect of how humans use or used horses. We spent the most time reading and re-reading sections on the horse as it was used in war, for work, for travel and in sending messages since Miss M was most interested in those topics, while we glossed over more quickly chapters on topics like horses in sports and racing. I really enjoyed how this book touched on many topics we’ve covered in the past two years of reading Mystery of History — the Huns, the Mongols, the first mail delivery system in Persia, Knights on horseback and more. A general reading of history doesn’t highlight the role of the horse, but the horse really was an important “player” in many of these important points in history. This book is definitely worth a read for horse lovers that are also history buffs. I’m not sure if this is a big segment of the population, but given that at least one publisher offers an entire course on the history of the horse, I would guess that there are a few others out there besides my daughter! This week Miss M and I finished “A Little Princess” by Francis Hodgson Burnett as our bedtime read-aloud. A lot of the books we read I could almost as easily just hand to Miss M and have her read herself. This was not one of them! In fact, I was very glad we were reading this one using the Kindle app on the iPad, because I had to use the handy “dictionary” feature a few times myself! A few friends were surprised that I had not read “A Little Princess” previously. It’s yet another “children’s classic” I missed as a child in my rush to get to reading books in the adult section of the library. If only I could have known what I was missing out on. At least that gives me more to enjoy and discover now! “A Little Princess” is the tale of the rich daughter of a British officer stationed in India. Her mother died at birth, and now her father is sending her off to school in London. Sara Crewe could easily be a spoiled little brat, but instead she is a model of virtue. She willingly shares and is kind to others and doesn’t let riches and privilege go to her head. A few chapters into the story, Sara’s fortune changes. She loses her wealth, status and most of her material possessions. She is faced with the challenge of living a life of princess-like virtues without her princess like material surroundings. I have a confession to make. After reading about seven chapters or so to Miss M (and seeing just how bad things were getting for poor Sara Crewe), I clandestinely skimmed the rest of the book one night after Miss M went to bed. Shhh….don’t tell her! She hates it when I do that! 😉 But, I just had to know if it was one of “those” kind of fairy tales. It’s not. Just so you know. I felt much more relaxed after knowing that, and we both enjoyed the story quite a bit. “A Little Princess” does not happily smooth over the harshness of life for those less well-off in late 19th century/early 20th century London, but I didn’t think it was inappropriately dark since Sara maintains a positive attitude through it all. The ending was almost a little over the top for me, but I don’t think Miss M felt that way about it at all. Has anyone seen a movie version of A Little Princess? I’m curious if it would be worth a watch. I’m linking up with Read-Aloud Thursday @ Hope is the Word!